One day a good friend of mine had an enquiry for a futuristic military character. He was a scenic artist and he had no concept of how to achieve armies of slick, three dimensional characters. He was, however, an excellent artist with an enviable outlook on life and with a common passion for motor cars. 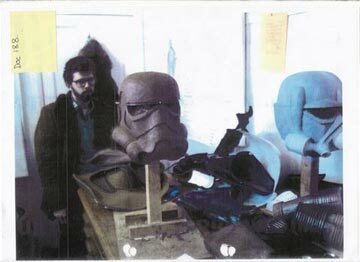 When he asked me if I could make him something workable, I didn't think twice..." Andrew Ainsworth talking about how he became involved in making the original props for ANH. Twickenham is in an old part of South West London. It was an artistic and creative environment in which to work, surrounded by film and television studios, theatres and famous landmarks which heralded the early days of rock music. This opinion is supported by Ralph McQuarrie`s (ANH Concept Artist) statement in an interview referring to the challenges of making the film, when he said that 'they would have the biggest problems making the Stormtroopers.' This sets the scene for Lucas' uphill battle to fulfill his dream...a fantastic achievement given the circumstances and lack of resources. By the 20 Jan, Nick was ready for his third meeting with Lucas at the Studios. 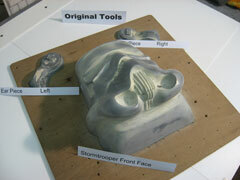 He'd prepared a red clay mock-up of a Stormtrooper head plus ideas for the Tuscan Raider mask, Jawa mask, belt and holster. At this meeting, Nick was given a guided tour of the Art Department and he observed the grey clay sculpting being done on the armour. John Barry (Production Designer) told Nick that they were at a bit of loss as to how to make the armour. Nick suggested that he knew someone who might be able to help...Andrew Ainsworth at Shepperton Design Studios was who he had in mind. 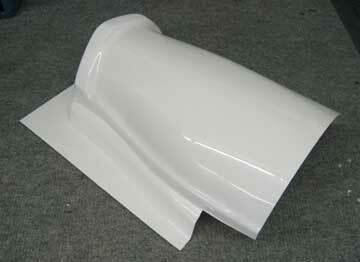 He could not use Nick`s mock-up in any way as it had no features such as surface,eyes or face. 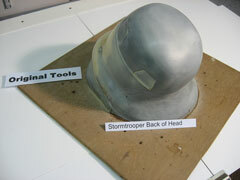 In any case, to achieve a complete plastic prototype, several separate moulds were required to produce parts that could be joined together to make a complete helmet. However, with the concept drawings, Andrew had enough information to sculpt a set of moulds, hued from a metal dust filled resin system that he had developed for producing moulds for previous products. 9 Feb 1976: Mollo and Nick have a meeting to discuss money. Nick conveys to Andrew the potential quantities that could be required. 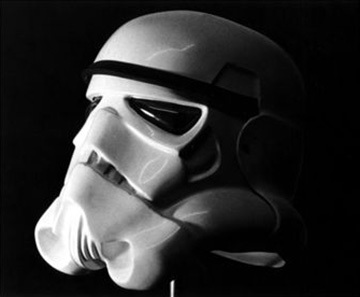 17 Feb 1976: Nick visits Elstree to show Lucas the final prototype Stormtrooper helmet made by Andrew. Nick's diary also records 'Budgeting with Andrew in the afternoon' and so the presentation must have been successful. Nick also records seeing some grey clay armour being sculpted, he was told that the studios were having problems with it - Nick recommended Andrew to solve the problem. 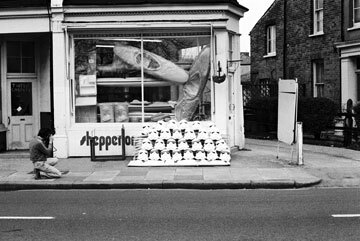 19 Feb 1976: Mollo had a 9.30 am meeting at Nick's and ordered 50 Stormtroopers and 40 Rebel Pilot (X wing) helmets. Nick's diary entry for that day records "Mollo here 9.30am – ordered helmets and invoiced them." Invoicing straightaway was a standard tactic for Nick. Being an experienced operator in the film business, he knew the routine and foresaw the potential pitfalls of getting paid. Andrew, on the other hand, was new at the game and willing to carry the can, trusting that Nick was a man of his word. 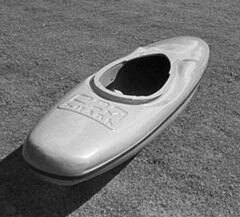 There was no official order or order number and Andrew had already created the prototype on a speculative basis so if it all went 'pear-shaped' Andrew would not have a leg to stand on. 25 Feb 1976: Nick's diary records one word against Star Wars: "PANIC". At a meeting at Nick's with Andrew, Mollo asks Andrew to visit Elstree the next day to discuss the production of the armour. 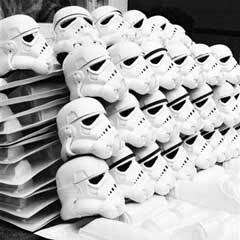 "The material was difficult to mould so the first batch of Stormtrooper helmets that went to Tunisia for the desert scenes were all shapes and sizes. Andrew made 50 Stunt helmets and every one would have been slightly different"
The helmet production progressed, athough several modifications were made. 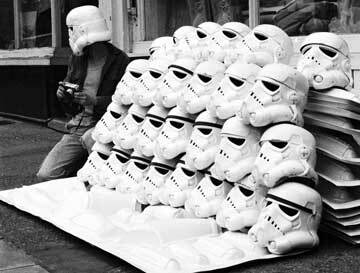 Finally 50 helmets were delivered to the Studios along with 40 X wing helmets and Andrew invoiced Nick for the work, still without any form of order or contract. The HDPE material was difficult to mould and, although it would form large undercuts okay, the shrinkage and distortion when releasing from the mould was terrible. This meant that many of the first batch that went to Tunisia for the desert scenes were all shapes and sizes. In the end, Andrew made 50 of the Stunt helmets and every one would have been slightly different, so it's only helmets made from the original moulds that will conform to the original screen-used helmets. The better quality Stunt helmets came on stream later when the white ABS used for the armour came in. While these did not suffer from shrinkage and conformed to the mould shape accurately, the ABS was more fragile so most of these did not survive. The helmets we make today are from an ABS material that accurately conforms to the original moulds and in addition has an Acrylic high gloss surface that protects the ABS from UV degradation. As Elstree Studios Art Dept struggles, Andrew is called in to make the Stormtrooper armour in time for the first shoot in Tunisia - less than a month away. In any event, John Barry gave Andrew a further sketch which portrayed a Stormtrooper with canvas type ammo pouches as per a soldier from the Vietnam war. He asked Andrew if he could make the armour in time for the first shoot in Tunisia, less than a month away. Andrew said he could, and the Art Dept at the Studios abandoned any further work on the armour and moved on to Darth Vader. 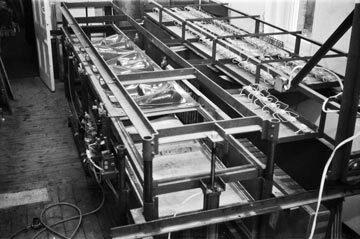 Andrew’s large vacuum forming machine had a 15 ft x 3 ft bed that could accommodate all the moulds in one hit. However, the old Sweet Shop in which it was housed was a bit tight for space to say the least. As it was also a little hot, moulded sheets of plastic were turfed out on the front pavement to cool down. After finishing with the film business and requiring valuable space, Andrew decided one day in the early eighties to have a clear out. 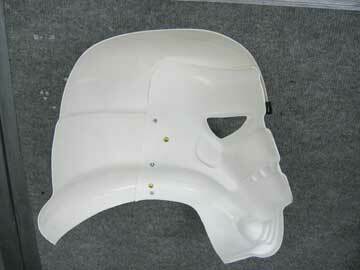 Out went the Stormtrooper armour moulds, but hekept the protective skins for reference. He also kept the moulds for the helmets as they were better made, in pretty good condition and possibly one day may have a use. 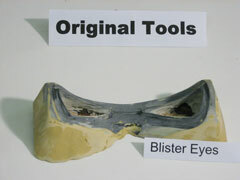 Andrew continues "We mean exactly what we say 'The Original Maker, The Original Moulds'. 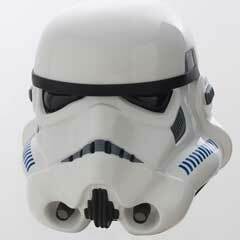 I make each helmet by hand using the original moulds* I made in 1976 for ANH. 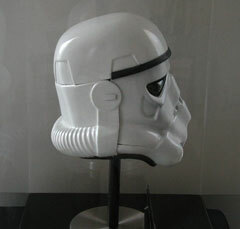 Helmets from us here at Originalstormtrooper.com are truly unique as they are first generation facsimiles of the on-screen designs and feature the same idiosyncracies as the original helmets. Invest in our helmets and armour and you acquire a piece of movie history."